It's my birthday today, and so I've decided to make today's post a list of five of my favorite things about the 1970s and 1980s. I have many, many more favorites, but somehow these always come to mind when I think about the decade. 1) Marathon bars, 1973-1981. Braided chocolate and caramel and a ruler on the back. Who didn't love it? Wash it down with a Pepsi Light and you're in retro heaven. 2) "Facts of Life," 1979-1988. I went to an all-girls high school and we never saw schools like ours on TV. I especially loved the later years, when they ran Over Our Heads and Edna's Edibles. Although I would like to punch that Pippa right in the mouth. 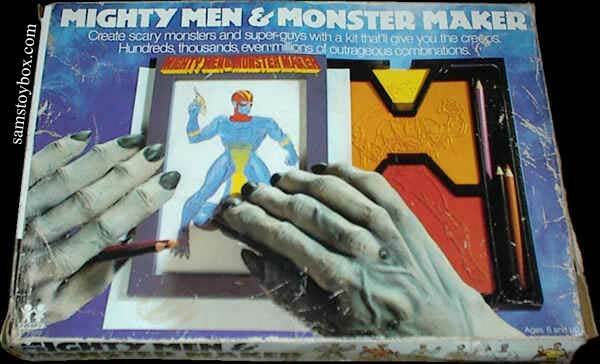 3) Mighty Men and Monster Maker, 1978. Bless my mom's gender-neutral heart, she didn't say one thing when she got me Fashion Plates instead and I asked her to exchange it for this. I was always a story-maker-upper, and half-men, half-monster creatures were much more conducive to my imagination than bland blondes playing dress-up. 4) "Grease," 1978. Who can't sing every word of every song in that movie? Ah got chills, they're mul-ti-plyin'. I still think "Summer Nights" is the best karaoke song on earth. Wella wella wella UNH! 5) "Charlie's Angels" trading cards. I was not a big collector, but I loved these, and spent hours sorting and organizing them. Never was into trading, and I never put together the big puzzle on the back either. But I bought a bunch of old ones recently and I swear there wasn't a photo in them that I didn't remember. What would be on your top five list? I usually wasn't given whatever popular toys were being marketed to kids in those days, so I had to make do with going to a friend's house to play with them. But TV was free in those days, so at least I didn't get shortchanged much in that department. I also had to hide my MJ love from my racist father, but mom colluded with me on that front, thankfully. I would do just about anything for a Marathon bar right now!